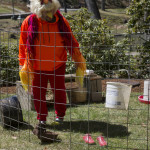 Dressing and behaving as chickens for three hours Linda Mary Montano and I occupied a large coop. 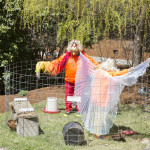 We scratched, pecked, prayed, clucked, laid eggs, dreamed, and other chicken things. Recorded chicken sounds and a drone chant played from two different speakers hidden in nearby bushes throughout the ceremony. Audience members ranged from a yoga class who did yoga for an hour of the performance to the uninterested passersby of the campus community. Viewers laughed, stared, photographed and videoed, shook their heads, ate lunch, made chicken sounds, pointed, meditated, walked away, walked away and came back, drank coffee, imitated us, and looked into the coup. Viewers attempted to feed us from a bowl of crackers outside of our coup. Some were successful, others were not. The work evoked and explored themes of freedom and captivity, flightless flight, spiritual presence and sacrifice, and the codependent pleasures of domestication. Near the end of the performance, some of the audience members decided to open the coup door and sit quietly, petting and comforting us. The work ended with two renditions of the spiritual, “I’ll Fly Away”. 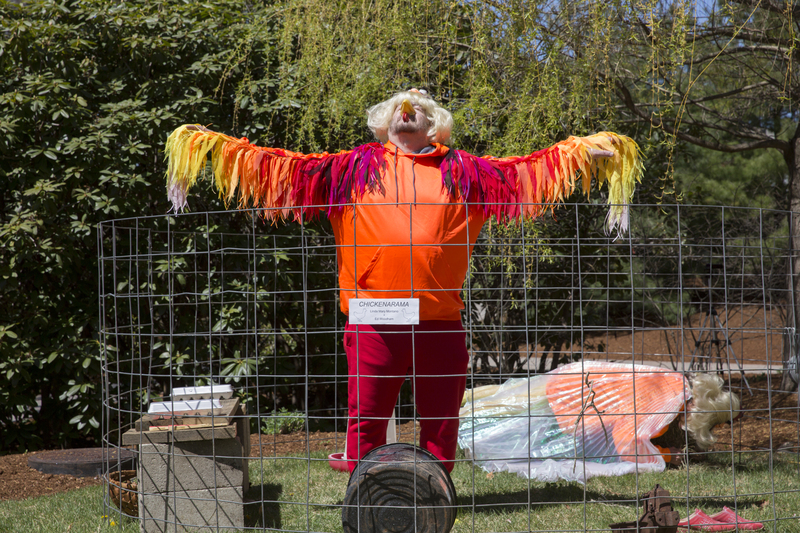 At the conclusion of the performance we opened the cage door and danced outside the coup with the audience. Some of the viewers hugged us tenderly. 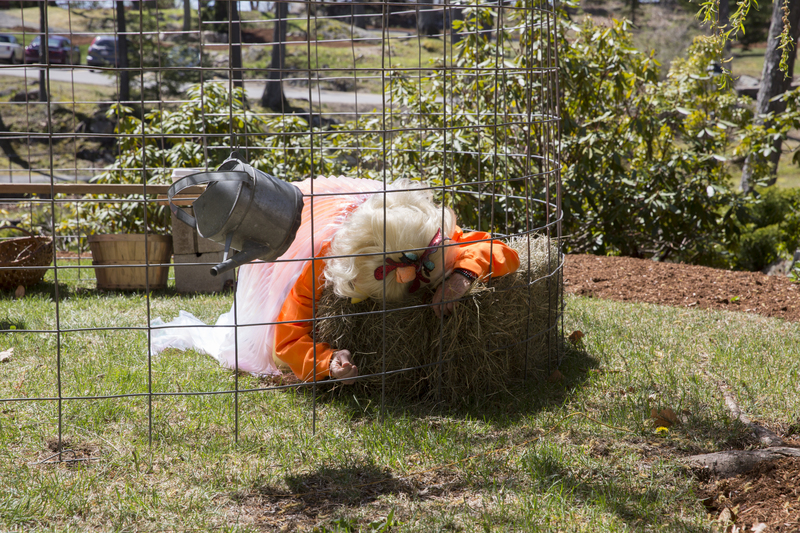 This work pays homage to the living sculpture and life/art tradition pioneered by Linda’s breakthrough performance piece, “Chicken Woman” (1972) her 1969 “Chicken Show” where she presented live chickens in 3 enormous cages for her MFA, and her years of chicken actions which continue to this day. The event was presented in conjunction with the gallery exhibition, “Dad and Mom: Art Giving Life”, the first showing of works created by Henry Montano and Carrol Hedger Woodham (our respective Dad and Mom) in their end-of-life art therapeutic practice of painting and drawing.